Kids who get health insurance are more likely to finish high school and college is the headline of an article in Vox about a new study that doesn’t provide any surprised to experienced teachers in low-income communities — students having access to health care results in increased academic achievement. 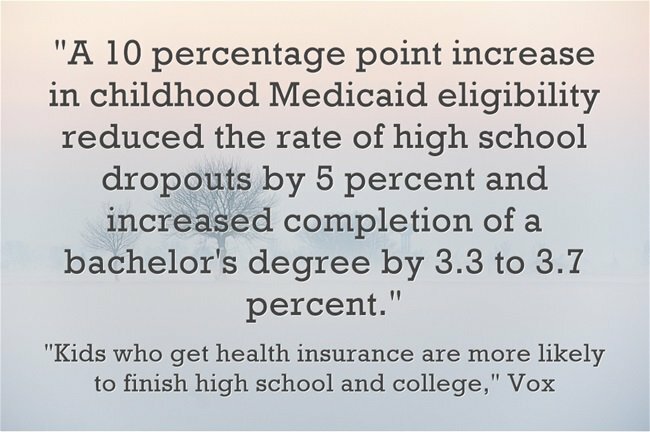 Two things could cause access to health insurance to influence educational achievement. The first is pretty straightforward — access to insurance could make kids healthier and healthier kids could do better in school. But there’s also a potential indirect effect — giving families health insurance could increase the financial resources they have available for non-health expenses, and that could help kids do well in school. The way the study is constructed doesn’t let us tell how much of the impact is coming from the insurance per se and how much is simply the financial benefit. I’m adding this info to The Best Places To Learn What Impact A Teacher & Outside Factors Have On Student Achievement.